The rain this summer though unwelcome has filled the rivers in Wales almost to overflowing. Almost everywhere you look in the mountains there are thin ribbons of water weaving there way down the steep slopes. All this water if feeding the voracious appetite of the valley rivers so they grow and bloat to twice, three times their normal girth. As they met rocks, bends and drops the river turns into a thundering, boiling waterfall with unimaginable volumes of water thrashing and crashing over the rocks. We spend a day at Betws y Coed a small town crouching underneath the hulk of Moel Siabob. A Mecca for those who enjoying shops selling outdoor gear. I’m sure they’ve had a roaring trade this year in waterproofs. Just south east of Betws-y-Coed on a junction with the A5 and the B406 we came across the The Conwy Falls Cafe, and so as a cup of tea beckoned we ambled in. It turns out this is the entrance to a walk along a steep sided valley leading to a fantastic waterfall. Yes – The Conwy Falls, you guessed it. We’d been to a number of the falls in the area before but had missed this one. And I think on the day we visited it is certainly the most impressive. The water is forced through a narrow cleft in the rocks to create a thunderous boiling torrent of foaming water. It’s here that two rivers converge, the Afon Machnojoins it’s big sister the Afon Conwy. A short distance down stream from the Conwy Falls are the falls that we wanted to see on this trip, Fairy Glen. This is a narrow and secluded gorge where the river forces it’s way through. Getting here involves a short walk along a wooded and wet path, followed by a steep slope down to the river. Again the river put on a spectacular display for us, it’s just a shame that the sun didn’t put up a show as well. Despite it’s name there are no myths attached to the place, so I suspect this is a Victorian tourist invention, like so many others. However, there is a long standing story in the area of the Afangc which caused a lot of bother to the locals. The Afangc has been described as various things from different sources, namely a crocodile, beaver, dragon, demon and dwarf like creature, but it is in fact Welsh for Beaver. Regardless, it was a troublesome pest that would cause flooding to the local area. When all attempts to kill the beast had failed, it was decided to entice the creature from the pool and relocate it to another lake out of the way. They used a local girl as the bait, and made her sing near the lake. When the Afangc left the lake to get near to the girl, the local villagers captured it and bound it in chains. Afon Conwy pushing through the narrow gorge at Fairy Glen. It was decided to remove the Afangc to Llyn Ffynnon Las (Lake of the Blue Fountain, which is now called Llyn Glaslyn) and they used a pair of oxen to move the monster. The Afangc was taken through the Dolwyddelan parish and through the pass between Moel Siabod and Cribau, called Bwlch Rhiw yr Ychain (pass of the oxen’s slope). One of the oxen struggled so much that it lost an eye on the western slope, which was then called Gwaub Lygad yr Ych (Field of the ox’s eye) and its tears formed a pool – Pwll Lygad yr Ych, which never dries up although no stream flows into or out of it. The rest of the journey to Llyn Glaslyn had no more incidents, and it is said that the Afangc jumped into the lake upon arrival, and was then trapped there by the lake’s rocky banks. Fairy Glen may not have a spectacular water fall but the volume of water rsuhing through this narrow gap is worth seeing. To the east of Betws Y Coed on the Afon Llugwy is another water fall. This is the one on the Welsh 100 list. And Swallow Falls do not disappoint, especially when running as full as they were a few weeks ago after all the rain. It is thought that the English name arose from a mis-hearing of the Welsh word ewynnol as the similar-sounding y wennol (swallow). 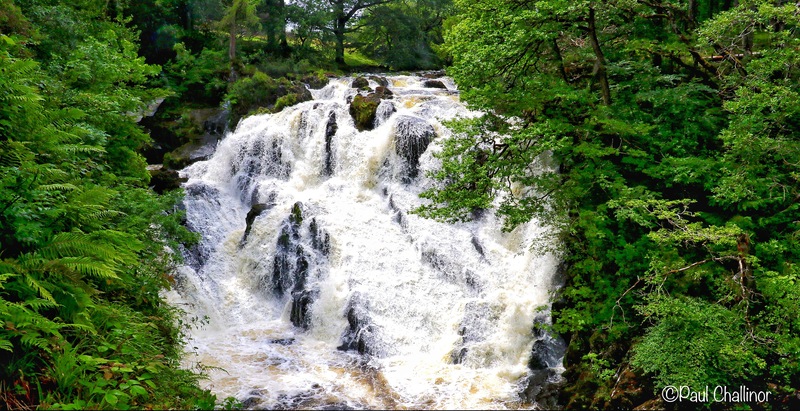 The original name was, and perhaps still is, Rhaeadr Ewynnol – Foaming Waterfall. And boy was it foaming while we were there. Swallow Falls. Not a swallow in sight. These falls also have their own legend. This time associated with a real person, though not one that was held in high esteem by the locals, but a member of an avaricious family who desired power and money, often at the expense of others. Sir John Wynne was a member of Parliament for Caernarvon in 1596, as well being a member of the Council of the Marches of Wales. He was also notorious for his violence and suppression towards his tenants and others who got in his way. It is said that his ghost is doomed to linger for ever in the depths of the pool below the falls. At Betws y Coed the Afon Llugwy joins the Afon Conway, which has already been swollen by the Afon Machnojoins four ther upstream. 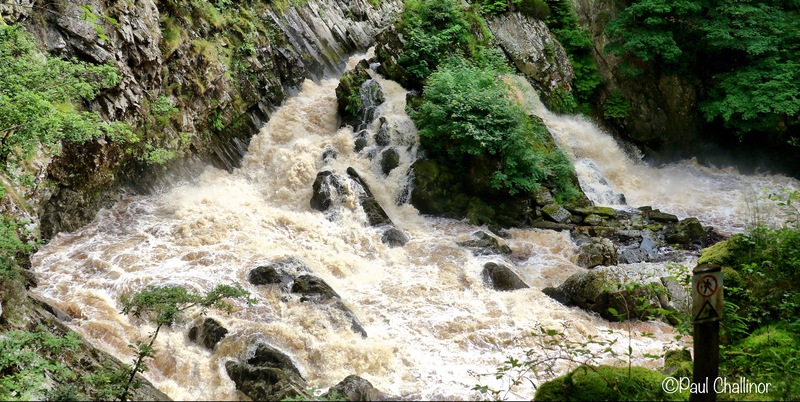 The Rapids in Betws y Coed were also swollen and thundering their own tune to the beat of drums. In the Lee of of one of the rocks we saw a heron peering hopefully into the water. This was not a fruitless task as we then saw fish jumping the rapids to get up stream to spawn. With this volume of water it was a sight to be seen. You might be asking yourself “Should I go?”. Of course you should. All these water falls within a 5 mile radius, you’d be silly to miss it all. There’s got to be something in there to eat!